We manufacture purpose-built Non Ferrous Furnace Equipment, Heat Treatment Furnaces, Kilns, Incinerators and associated equipment including Repairs and Spares from our factory base in the United Kingdom. Formed as a company in 1971, J B Furnace Engineering Ltd has earned a reputation for manufacturing quality furnace products, on time, at a competitive price. Our services cover the U.K., Europe, South America, Africa and Asia. 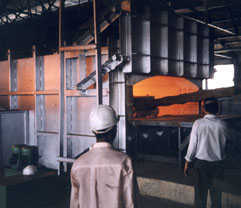 We are also consultants, designers and installers of refractory linings on a world wide basis. Our products are supported by a professional team of sales, technical and service personnel who will deal with your enquiries in a quick and efficient manner. We also have manufacturing, replacement spares and support rights for Leeds and Northrup (L & N) Heat Treatment Furnaces.